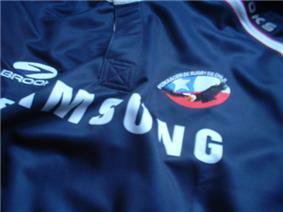 The Chile national rugby union team (nicknamed Los Cóndores, "The Condors") is a rugby union nation representing Chile. They first played in 1935 and have yet to qualify for the Rugby World Cup. Rugby union in Chile is administered by the Chilean Rugby Federation. Chile has been playing international rugby since the 1930s. Chile made their international rugby debut in 1936, against fellow South American nation, Argentina. However, Chile were defeated 29 points to nil by the Pumas. Although there was no qualifying tournament for the first World Cup, Chile would try and qualify for the third tournament, the 1995 Rugby World Cup in South Africa. Chile lost a close game to Paraguay, but losses to Uruguay and then Argentina saw them knocked out of the qualifying tournament. Chile competed in Round 2 of the Americas qualification tournament for the 1999 Rugby World Cup in Wales, and won both of their fixtures to finish at the top of the final standings to advance to Round 3. There Chile defeated Paraguay, but lost to Uruguay and were knocked out of contention. Chile started out in Round 3 of Americas qualifying for the 2003 Rugby World Cup, where they defeated both Paraguay and Brazil to advance to Round 4, winning two fixtures, but not qualifying for the World Cup. Chile would then attempt to qualify for the 2007 Rugby World Cup in France. They started off in Round 2, and won both their fixtures against Brazil and Paraguay to advance to Round 3, where they met Argentina and Uruguay. Chile finished third and were knocked out of the qualifying tournament. However, their results proved them to be the third strongest team from South America, after Argentina and Uruguay. The home kit consists of a red jersey and blue shorts adopted from the colors of the Chilean flag, and the away kit consists of a blue jersey and shorts. The crest features the logo of the Federación de Rugby de Chile. The current national team kit is manufacturer by Mitre Sports International. Ireland national rugby union team, Argentina national rugby union team, Estadio G.E.B.A., Argentina, University College Dublin R.F.C.